Copy’em Paste is a simple-yet-powerful clipboard tool for speeding up your daily copy-and-paste workflow. 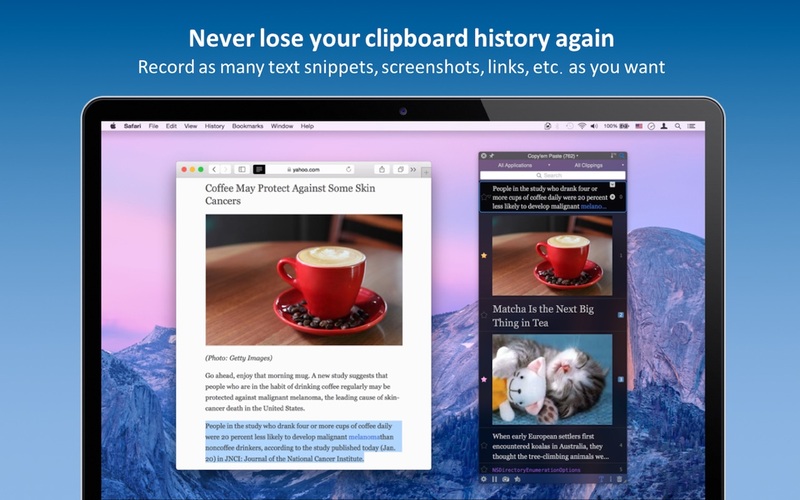 It automatically keeps your copied text, images, links, screenshots, etc., and lets you recall/paste them anytime, right at your fingertips. Use it to copy items consecutively and then paste them (without the usual, back-and-forward copy/paste round trips), store favorite clippings permanently, take screenshots without clogging up your desktop, collect data for research, expedite pasting of clippings, transform pasted text, organize clippings into lists, and so on. All done with amazing speed, making it a time-saving, highly valuable productivity tool! Can be configured to paste into VNC, NoMachine, Parallels, etc. Sort clippings by creation dates, most-recently-used dates, and paste frequency, etc.